The Moto G5 Plus was recently released, and is possibly the best budget phone you can buy. 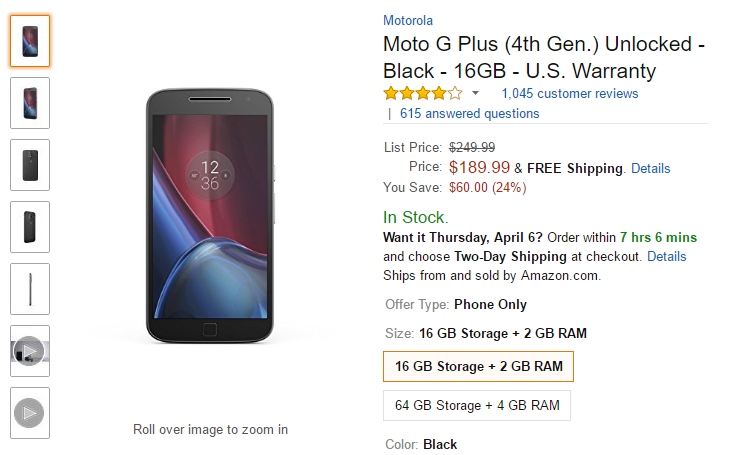 But if the $229.99 price tag for the G5 Plus is a little too high, you can now get the last-generation G4 Plus for just $189.99 on Amazon. Despite being a budget phone from a year ago, the G4 Plus is still a pretty decent device. It has a Snapdragon 617 processor, a 5.5" 1920x1080 IPS display, a fingerprint scanner, and a microSD card slot. The model on sale has 16GB of storage with 2GB of RAM. Motorola isn't great when it comes to updating its phones, even on the company's flagships. Nougat just started rolling out to the G4 Plus in the United States, but I wouldn't be too sure on a future Android O update (at least officially). Still, you'd be hard-pressed to find a better phone under $200 with full support for all major US carriers. You can buy it at the link below.